Ridiculous. I can't believe it's been 7 months since I have written anything. I feel sorry for all of you for missing out on our exciting life. :) We've had a great year so far if you've been wondering! There is no way I'm going to try and play catch-up since February so we're going to just start here in August. So, first off, last week our precious Eva turned 6! Whoa, I don't know how that happened but she is just the sweetest 6 year old ever. She is funny, compassionate, thoughtful, creative, caring, aware and so much more! She has really blossomed this year and I am so proud of her. Big things to note: she learned to ride a bike without training wheels several months ago, learned how to blow a bubble with bubblegum (something to be proud of folks), and learned to swim! She is so fun. And yes, another big thing is she will be starting kindergarten this year AND I will be her teacher! What the what?? We are going to homeschool and are super excited about it. More to come on that! Aaannnd this is when everything went South. Eva burned her finger right when we were singing Happy Birthday. Classic. Ol' Ella had to step in and blow out the candles because poor Eva was a little distraught. But, she did recover and enjoyed the rest of the party so all turned out well. Now to this crazy little skater. Talk about another fun, sweet and amazing little girl. Ella is one funny cat. She really was having a good time in this picture even though she looks miserable. :)I am amazed everyday at the blessings God has bestowed on me in Eva and Ella. Amazing I tell you. She thinks she is pretty big and wants to do all the big girl stuff that Eva does. She will turn 4 at the end of August which is just crazy to me! Ella is doing great. We have enjoyed just letting her be a little girl and do things like ballet, gymnastics, and just play. She isn't in anything therapy right now and is really just doing so well. We would love your prayers for her though as next Friday, August 17 she will be having surgery. This is a surgery we have known she would need since she was born but just didn't know when it would be. And honestly this is a year earlier then we really expected the surgery to be but we feel good about it and are thankful that she is healthy enough to have it done now. So, she will be having abdominal surgery to fully close her muscles next week. If you remember when she was born they put her organs back in and were only able to cover them with skin and an artificial patch because they couldn't even get all the skin over everything or any muscle because the omphalocele was so large. This surgery they will go in and remove that patch and pull her ab muscles together over everything and hopefully if there is enough good skin this time they will create a bellybutton for her. Right now she kind of looks like she is pregnant because of the hernia so this surgery will help flatten her tummy out and provide that extra layer of protection over the organs that we all have. I'll post some before and afters ( you know how I love those) so you can see what I'm talking about. You can kind of see in the picture I've posted below how her tummy sticks out. So, this is big time for sweet Ella! Please be praying that all goes smoothly and the recovery is quick too. Her surgeon said she will be pretty sore for a couple of months and really will not need to be doing any big activity so I'm really not sure what to expect. We would just love your prayers once again for our precious Ella. Thank you for being her prayer warriors for the past almost 4 years! We'll keep you updated! I'll leave you with this gem. We think this picture is hilarious! 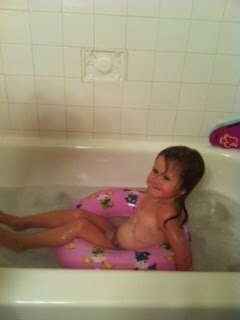 Why not "swim" in the tub? Ella has fun where ever she is! So great!